Iranian nuclear chief reveals if it wasn't for Moscow, controversial nuclear deal never would have been completed. Iranian nuclear chief Ali Akbar Salehi on Sunday revealed that Tehran's ally Russia was instrumental in getting the controversial deal on Iran's nuclear program passed last July, and implemented earlier this month. According to Salehi, head of the Atomic Energy Organization of Iran (AEOI), the deal with world powers in Vienna never would have happened if Moscow hadn't pushed it through. 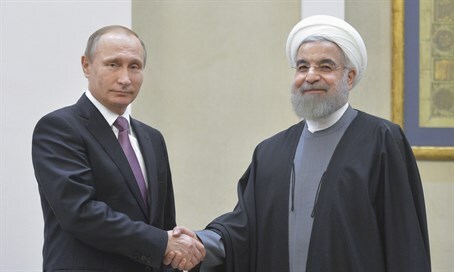 "Prior to the final deal, (Iranian President Hassan) Rouhani held talks with (Vladimir) Putin, the Russian president, and Mr. Xi Jinping, the Chinese president, and he stressed that the Islamic Republic expected Russia and China to help settlle the nuclear case," Salehi said, as quoted by the semi-official Fars News Agency. "Russia, in particular, took practical steps, and without its close cooperation, we might have never been able to sign and implement the accord," he revealed. The AEOI head went on to say Russia played a key role in swapping Iran's enriched uranium with yellow cake, thereby fulfilling one of the requirements to implement the nuclear deal. Iran and Russia are both militarily involved in Syria, where they are propping up the regime of their common ally Bashar al-Assad. The controversial nuclear deal allows Iran to inspect its own covert nuclear sites such as Parchin, and likewise Tehran can simply wait for the limitations on its nuclear program to expire under the deal in 15 years. The leading state sponsor of terror continues to show hostility towards the US, recently capturing ten sailors, and the US Secretary of State John Kerry has admitted the windfall from lifted nuclear sanctions will go to terror. In addition to its breaches of UN sanctions in missile tests, Iran has further flouted expectations from the deal by earlier this month publicly revealing its 14 underground "missile towns," with the latest facility being shown on Iranian media as convoys of the nuclear-capable Emad missiles were transferred in.